Parts one and two looked at the Westway Trust’s initial proposals for the space under the Westway and Westway23’s response. But, what is Westway23’s positive vision? I spoke to Toby Laurent Belson, Artist/Designer/Organiser at Westway23, aware that the Westway Trust’s approach won’t be challenged effectively without a credible alternative. “We want wellbeing through healthy minds and bodies that can fulfil Maslow’s ‘Hierarchy of Needs’. Also spirituality and a connection to the earth and a larger purpose. We want opportunity. Break all of that back down to concrete ideas and you have spaces for creativity, spaces for spiritual enlightenment, spaces for cultural celebration, spaces for education, spaces for socialising, spaces for health, spaces for innovation, spaces for the development of people in ways that do not limit their potential. All of it led by and initiated by people who are hardly ever given the reigns to such things”. How does this contrast to what is happening at the moment? “This area – the Westway Trust and the council – sells itself for a dollar amount on the image of diversity and creativity. Yet those who are actually responsible for that image struggle to survive, let alone prosper”. So what will work instead? “Let’s have a can-do attitude. A ‘Why Not?’ outlook for our people that extends further than tired, top-down developments that could be anywhere in the world. The 23-acres of the Westway has always been there to fulfil the wants and needs of the local people and it has been kept away from them”. To this end, Westway23 has organised itself in to five sub-groups: Marketing, Fundraising, Legal, Research and Alternative Vision, with members designated to each based on their area of expertise or profession. 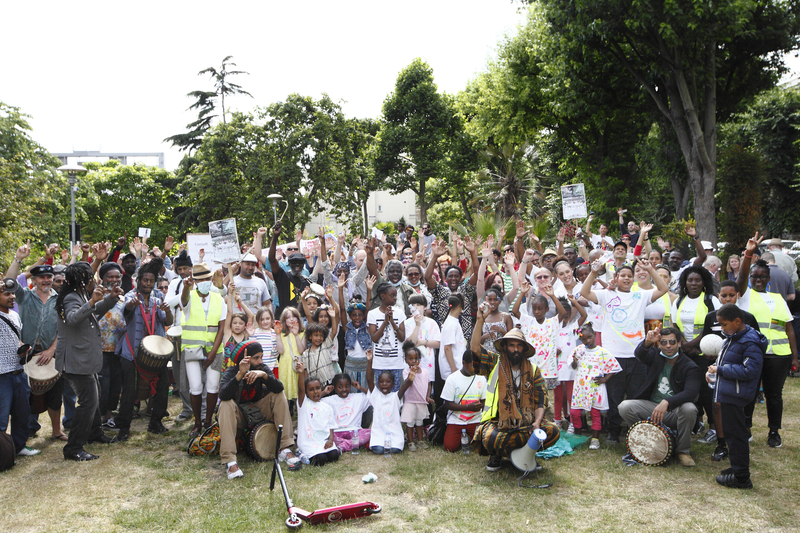 As well as lobbying on behalf of the community, Westway23 told Urban Dandy that it “is supporting community members and organisations currently facing challenges on, and in many cases eviction from, the 23 acres as a direct result of Westway Trust’s actions”. On the fifth of July Westway23 held a demonstration attended by hundreds of people who marched along the route of the 23 acres. Children mixed with drummers, flamenco dancers, artists, teachers, bohemians, normals and Martin. This followed an earlier march to Holland Park Opera House, beneficiary of millions of pounds of public money, despite it being a loss maker. Westway23 are active, drumming every Sunday on Portobello Green (weather permitting) and with regular Wednesday evening meetings at the Venture Centre. Keep up to date here: http://www.westway23.org/. Metres away from the Westway on Ladbroke Grove, the KPH pub is under threat from private developers/speculators who want to build more flats for the affluent. Meanwhile, across the borough, children are being displaced in to insecure, inadequate temporary accommodation miles away as government cuts to local government budgets are deepened. Many families earn their poverty in insecure, under-paid jobs. In these circumstances, people rely on their culture to provide attachments and a sense of identity, worth and shared values; a sense of belonging. Under such pressure, uncertainty and insecurity define the economic, political and family life of communities. It is appropriate that people look to the custodians of the 23 acres, the Westway Trust. But how will they respond? Their updated Portobello Village proposals are fresh off the press, see here and Urban Dandy has requested an interview. Watch this space.